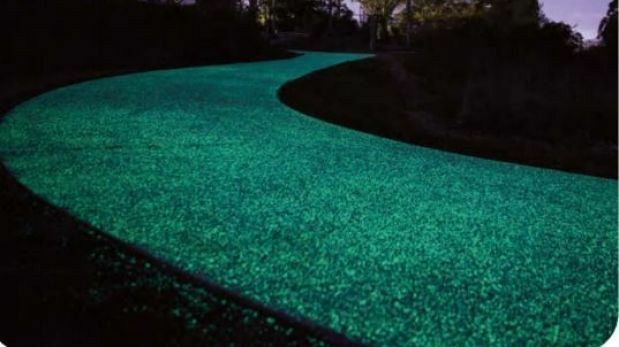 Glow-in-the-dark pathways are coming to Brisbane as the city explores new ways to light up darkened paths at night. At Tuesday's Public and Active Transport Committee it was revealed the council would install Moon Deck – a glow-in-the-dark resin – on a pathway at Obrist Place, Rochedale, as part of a 12-month trial. Council officer Coby Grosert told the committee the product could be used on existing as well as new pathways and was designed to benefit people walking and riding. "It's highly slip-resistant, so during the day it essentially looks like a fine-grade concrete path and at night it luminesces this soft green colour," she said. "Essentially, after dusk the product reaches its peak luminosity in a few hours and maintains its luminosity until dawn the next day." Ms Grosert said the product, which had been successfully trialled in Canberra in 2015, was used when other lighting solutions weren't suitable. Feedback from the trial at Ferny Grove said it provided good edge delineation and was effective for walkers and riders with no lights. The 200-metre path at Rochedale is adjacent to a conservation reserve and residential area and will be installed later this year. The 12-month trial will include different testing at six months, 12 months and community consultation. Ms Grosert said the results of the trial would determine if the product was suitable for other Brisbane locations. Public and Active Transport chairman Adrian Schrinner said there would always be the need for standard lights for personal safety and in places where there were large volumes of pedestrian or cycle traffic. "Our lighting program will be ongoing, but there are some situations which may not be appropriate for lights," he said. "An example would be through a bushland area where there is no cheap or easy connection to the power. "There is also potential impacts on wildlife as well. If you go through a bushland reserve area and light it up like a Christmas tree that affects the way the animals behave in the area." Moon Deck is understood to not need direct sunlight to change, has a 25-year life span and costs about $105 per square metre.